Even the "pole hangers" pay $5 for the privilege to grab onto a pole! Powell cable No. 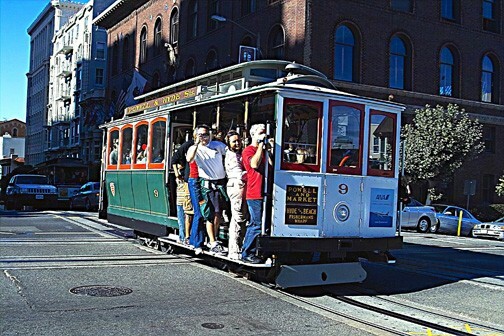 9 is crossing the California Street cable line; if one of our pole hangers had transferred from a California Street cable car the total cost of the journey would be $10! A return cable car trip would be another $10; not too good for a family of four. On September 1, 2005 because of San Francisco's deficit problems most Muni fares were raised. The basic cash fare (with a free transfer) was increased from $1.25 to $1.50, a 20% rise; whereas the basic cable car fare (no transfer privileges) went to $5 from $3, a two-thirds rise. Differential higher cable car fares did not exist until April 1982, when they were implemented as a result of a vote by the electorate. Voters were told the extra revenues were needed to pay for the system-wide cable car rebuilding that did occur between September 1982 and June 1984. This fare policy has been controversial, most notably since the implementation of the current $5 fare. Therefore, it was decided to obtain views on this important issue and to use as a vehicle a method designed by Friedel Klussmann the "Cable Car Lady". When the city-owned Powell Street cable cars were threatened in 1947, Friedel Klussmann evolved a contest centering on the unfinished question: "San Francisco without cable cars would be like ...?" It was interesting to see that about 4 entries were in favor of the $5 fare, about 35 were opposed to it, and about 2 were neutral. Thanks to the three judges: Emiliano Echevarria, Val Lupiz, and Gordon Miller for devoting thought and effort to making a good choice. 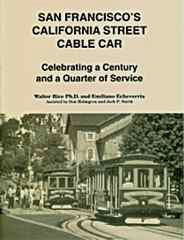 Peter will receive one copy each of San Francisco's California Street Cable Car; Celebrating a Century and a Quarter of Service, by Walter Rice and Emiliano Echeverria, Harold E. Cox Publisher and a copy of When Steam Ran on the Streets of San Francisco, by the same authors, Harold E. Cox Publisher. Ted will receive San Francisco's California Street Cable Car; Celebrating a Century and a Quarter of Service. A note from Walter Rice: As an economics professor of Managerial Economics my bias came forward. After the judges had rendered their independent decisions, I felt this entry merited a reward. Muni assumed the demand in the range of a price increase from $3 to $5 is relatively inelastic. That is the percentage increase in price will be greater than the percentage decrease in ridership. Revenues therefore will increase. Data proves Muni is correct. When the Market Street Railway increased its fare to 7-cents and Muni along with Cal Cable held to 5-cents the impact on the Market Street Railway was highly elastic. Ridership decreased on the Market by a percentage greater than the fare increase percentage. Thus, the Market�s total receipts fell. In many areas of the City 5-cent rides from competitors were easily available. Muni�s ridership boomed -- surpassing in 1939 its pre-Depression 1929 levels. With the extra revenue Muni purchased the five "magic carpets." See the original contest page. Val Lupiz created this dash sign to announce the contest. All rights reserved. Copyright 2006-2007 by Joe Thompson. All rights reserved.